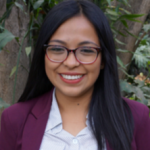 Estefani is originally from the capital city of Guatemala and was selected as a GOJoven Guatemala Fellow when she was 22 years old. She is in her final year of studying for her Bachelor’s in Social Work, and is passionate about her work for the Tierra Nueva Organization where she facilitates SRH and DSR discussions to youth groups from Santa Bárbara and Nentón. Estefani believes that the Integral Education in Sexuality is important for the prevention of maternal deaths, early-age pregnancies, and STDs among adolescents and youth. She is committed is to educating others in a way that responds to the needs and life experiences of all people, assuming that all people are equally different. Her mission is to dismantle the social patterns that make it impossible for young people in student, labor and political spaces to participate in advocacy, especially as they are the largest population group in the country and have the greatest potential to influence national, departmental, and community well-being.